A COUPLE of weeks ago my brother Paul erupted in the middle of a conversation with considerable irritation that the national blood bank had run out of a rare blood type and someone was drumming up a campaign to urgently find this blood for a patient. His irritation was understandable; this was certainly not the first we were hearing of a patient in need of life-saving intervention and some rare blood type being in short supply. But why, he asked, does the Blood Bank not keep a database of those people with that rare blood type and keep going to them for regular deposits? If I am not O- today and I can’t donate that blood type I still won’t be O- next year and will feel as helpless when there is another distress call! He had a point, but the conversation went its merry way and life moved on till several days later my friend Kamara Ariho told me his uncle couldn’t undergo critical surgery because there was insufficient blood at the Blood Bank to call on in case something went awry during his procedure. The family was working out ways of contributing blood but the procedure is not as straightforward as putting together money for drinks at a wedding. It is actually simpler, but requires more advance planning. That’s where we are challenged – advance planning. And that was what was irritating both Paul and Kamara. But to the credit of the people in charge, there is a register of blood donors that gets called upon when needed. In the past among the cards and paperwork I always had in my wallet was that little card they give you when you donate blood. When you present that little strip card to the blood bank you are given priority as a blood donor, should you be in need of blood – and I have used them a couple of times. You have to plan in advance though because the blood you donate to a blood bank must be screened and tested and taken through other scientific steps I am not academically qualified to elaborate here. But having gone through the donation and retrieval experiences many times myself I knew the anxiety families go through when they realise blood is suddenly needed. But even at that critical time, sadly, not many families rally round and become regular lifetime blood donors. Another friend, Nada Andersen, annually makes pilgrimages to donate blood and keeps mobilising us to join her. This week I had blood on my mind when I got fed up of the high-brow analysis in one of my many WhatsApp groups where Kampala-based people dissect such things as John (Donald) Trump and his political beliefs and basic bad manners. I interrupted their intellectual banter with a reminder that right here, just a few metres from all of our mobile phones, we could get together to solve a national blood bank issue rather than talk about Trump’s being a misogynist. The seniormost officials in the Ministry of Health confirmed to me that there is, indeed, a shortfall in stocks of blood – for a variety of reasons including few donors and lack of certain sundries. Our annual need is 260,000 units but we only collected 240,000 last year. Also, the shelf life of blood is 35 days only, so if we don’t consistently replenish the stocks then…(and that explains why sometimes there is an urgent need for the rare blood types). Since in recent days a national debate has arisen over whether or not to refer to a certain court order as stupid, here are some clear candidates for the adjective: Anyone who discusses Trump and Brexit et al while riding around in this town at risk of finding themselves in urgent need of blood, and has never donated blood; Anyone who can donate money for a party activity but has never donated half a litre of blood that would be life-saving if said party activity results in a medical emergency; and so on and so forth in that vein (excuse pun). To free myself of any such description, I went back this week and was pleased to find that the process is still quite easy and straightforward. Better still, computerization has now been introduced, so Paul’s irritation will decrease in future. First of all, it’s not just a ‘Blood Bank’, we have seven Regional Blood banks at Arua, Fort Portal, Gulu, Kitovu, Mbale, Mbarara and Nakasero, and six blood collection centers in Hoima, Jinja, Kabale, Rukungiri, Lira and Soroti (says ubts.go.ug). UBTS is the Uganda Blood Transfusion Service, headquartered in Nakasero where the Nakasero Blood Bank stands. There are pleasant people there trying to do their jobs well, even though the toll free line listed on the website (0800122422) is currently out of service. That’s an opportunity right there for some telecommunications company to offer something right away. As I dialled their listed land lines (the call attendant could do with some phone etiquette training) I realised that we all need to save the numbers in our phones because one day we might need them (0414259195/0414257155). Imagine you one day need blood urgently and you are standing in a hospital corridor with panicked relatives all scrolling through phone books for help. Won’t you will feel silly seeing contacts of Rolex guys, mechanics, boda boda men and all the other day-to-day people you find important rather than the lifesavers? The process, as I said, is quite simple. At Nakasero they have six beds so they can easily handle six people at a time at the drop of a hat, but if many more turn up then they will mobilise more beds and other equipment. The ladies who handled me were courteous, strict and happy to be of service – insisting that I waited my full ten minutes while resting after I had donated, even though I claimed to be strong enough to up and go. and made a mental note to take them a Christmas gift at the end of the year – may even to all the Blood Banks. Those small gestures also make a difference in a way. But I also hope for bigger differences in the way we do things as individuals and companies. I hope some restaurants or hotels, for instance, offer special discounts to people who present valid blood donation cards. After we have given blood, one of the items a donor is given is a soda and a biscuit or two (I declined, as I had carried a health drink of my own). The soda and biscuit companies should wake up to a campaign where we get discounts if we present a valid blood donation card. The t-shirt and merchandising companies can also throw in a few gift items for donors, just to say ‘Thank you and come again!’ to people with valid blood donation cards. I keep saying “valid blood donation card” because the rules say men can donate once every three months and women once every four months. Donating once in your lifetime is certainly NOT enough. And this blood, as numerous stickers and flyers at the Blood Bank state, is FREE OF CHARGE. Nobody asks you to pay for it. You and I can mobilise more people to donate blood; the UBTS Director, Dr. Dorothy Kyeyune, told me that NSSF ran a blood drive last week that collected more than 4,000 units of blood! LET’S DO MORE TO SAVE LIVES, PEOPLE! I ended up in the corner of the school at the elevated latrines and paid those a quick visit, which got them chittering and pointing fingers at me. When I stepped out of the latrine cubicle I found a small crowd waiting to see the spectacle, and though they didn’t give me a round of applause, I descended like a performer getting onto a stage. Little did I know that I was slated to put on a little performance. Having noticed a sign on the wall that instructed us to wash our hands after using the toilet, I expected to find a receptacle or something for water and some soap on hand as soon as I walked out of the latrine. There was none. I was flabbergasted and disappointed. 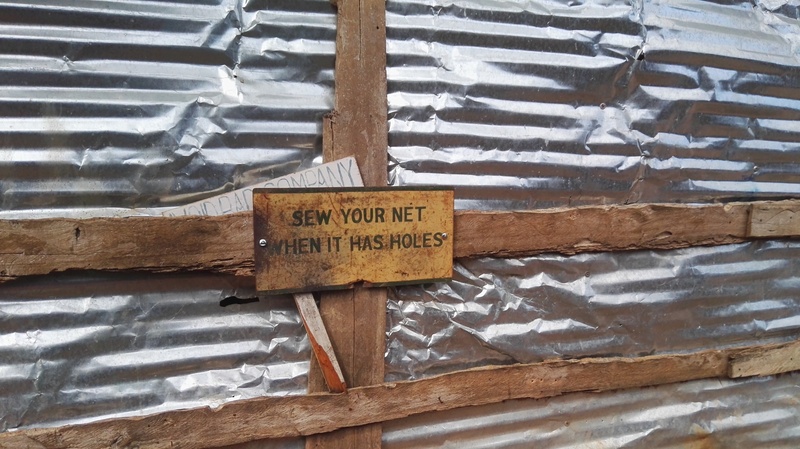 I had hoped that this poor school in rural Uganda was walking the talk. 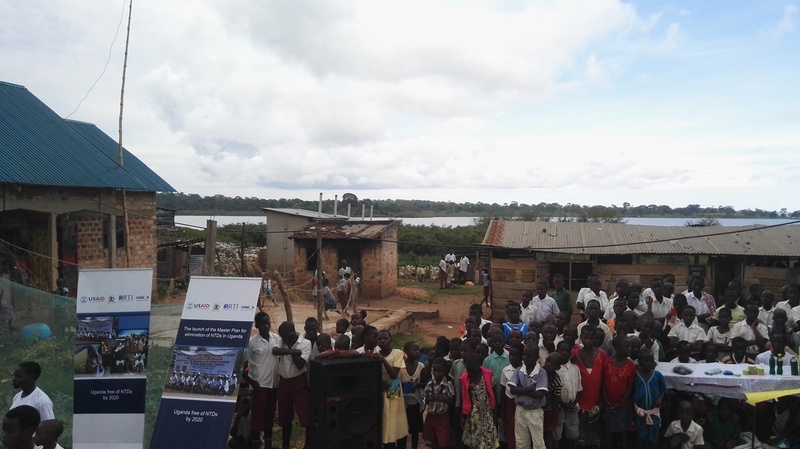 The entire village is highly susceptible to water-borne diseases the experts now refer to as NTDs (Neglected Tropical Diseases), and was the target of some serious programmes run by the Ministry of Health, USAID and RTI International. The programmes they run are simple but highly effective. 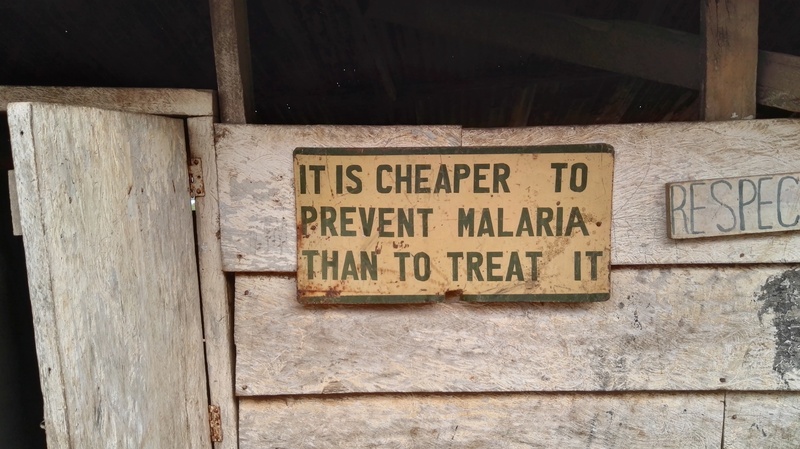 Just by getting children to take their preventive medicines seriously, parents to use mosquito nets as mosquito nets rather than as fishing nets, and everyone to use soap as often as possible, the entire community benefits in a massive way. Children spend more time in school, and therefore learn more; more of them therefore end up advancing to higher education, and the economy overall improves because they go out to do more than join the fishing or attendant trades. The children gathered outside the latrine realised what my problem was, and pointed at a contraption that I had seen but failed to figure out as I walked past it to the latrines. It was a wooden stand of poles set at four angles forming a square, with some 3-litre jerrycans tied to a wire going round the top. The jerry cans were recycled from used vegetable oil ones – as well do in our homes – and most of them contained a little water. 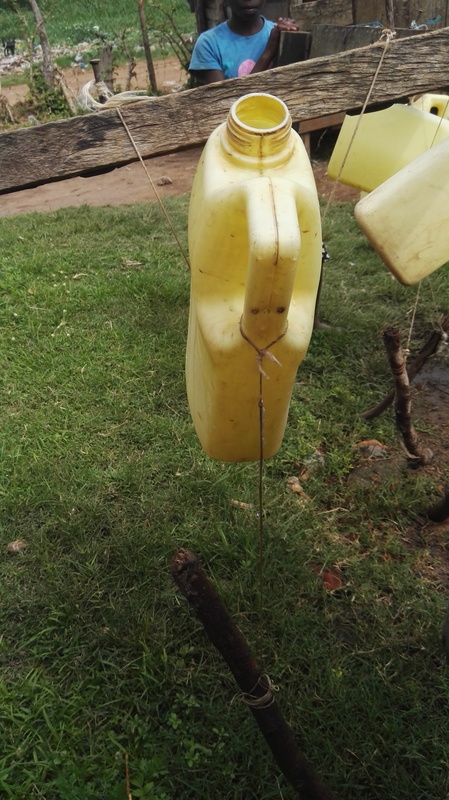 What puzzled me was a string tied to each jerry can, that was linked to a piece of wood hanging down to the floor. One child, eventually identified as Joshua, stepped forward to free me of my conundrum, and pointed at one jerry can, then the stick. I had already seen them, but did not wish to be rude, so I leaned forward and tipped the jerry can with one hand to wash the other, but before switching he shouted, “No!” and gave me a demonstration that almost blew my mind. 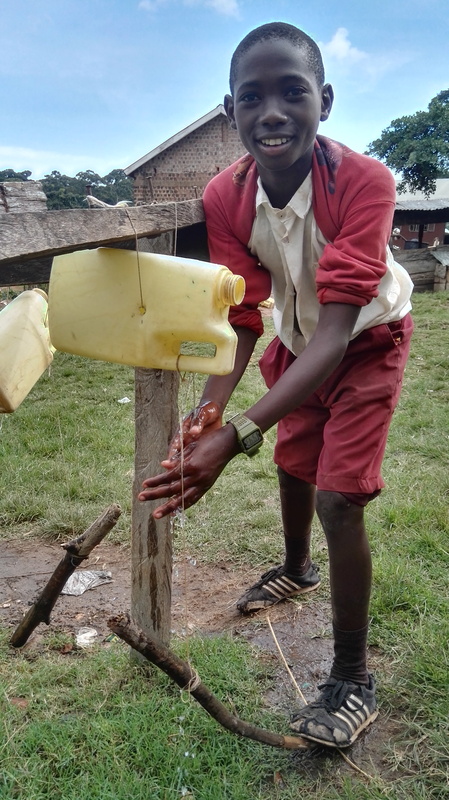 The way it works is that you step on the stick with one foot (you can’t use both), which action pulls onto the string and tips the jerry can downwards to pour water out for you (or the children) to wash hands. It’s as simple as that paragraph has it, as the video in this link shows. To complicate matters a little bit, the jerry can I used had a couple of holes punched into it near its mouth top, which made for a nice trickle from the perforation. But the water quickly gushed out after that through the top of the jerry can. The children were pleased at how surprised I was, and laughed quite a lot as I made them demonstrate again and again. On Twitter, I asked if anyone could work it out from the photograph and found that some people knew about this system – called the ‘Tippy Tap’. I haven’t checked to find out where it was invented or who by. It is just amazing. 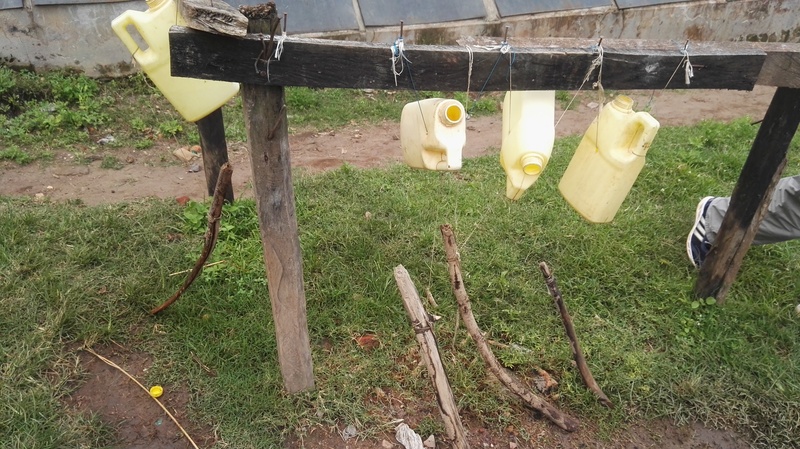 A water delivery system made only from local and recycled materials. I’ve built a house before and know quite well how expensive it is to get all the plumbing into place and running fine, but the next house I am involved in will definitely benefit from the tippy tap though in an advanced form. There must be an engineer in Uganda who can make some improvements to the system so that we can adopt it in homes both urban and rural. By just putting a cover onto the small jerry can, for instance, one can use less water to wash one’s hands. Now if an engineer worked at combining a rain water catchment system with a series of filters and some tippy tap for the showers and basins, the imagination boggles!